Harley’s Joker made his cosplay debut at San Diego Comic Con in 2012, and the internet went a little crazy. With his devilish grin and highly animated bravado, it was as if the Joker materialized onto our screens. For three years he would appear at conventions around the world bringing with him a chaotic spontaneity, entertaining convention goers and organizers alike. As a photographer and digital artist, his consummate attention to detail has led him to produce some of the most impressive cosplay images ever made, painstakingly recreating as photography the iconic artwork of illustrators like Brian Bolland, Neal Adams, and Alex Ross, sometimes working for months creating a singular image. Since 2013 he’s been accompanied by his partner in crime, Joker’s Harley, spreading mayhem side by side. He would make his final outing as the Joker at New York Comic Con, October 10th, 2015. 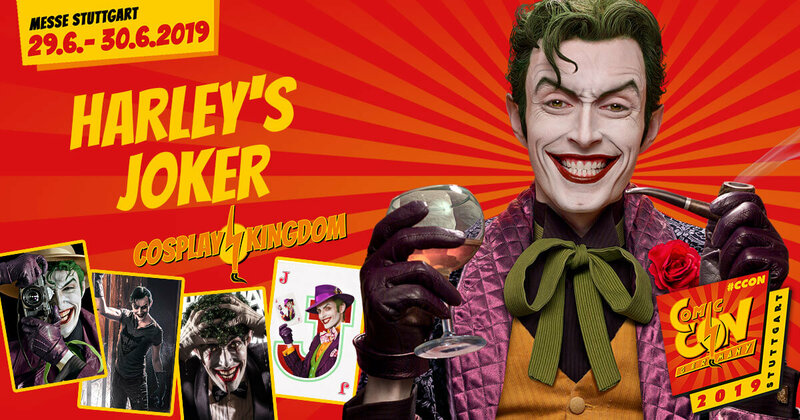 This June in Stuttgart, Germany, the Clown Prince of Cosplay, Harley’s Joker, is incredibly excited to announce he will be appearing in costume publicly for the first time in nearly four years. All weekend long he plans to wreak havoc, put a smile on your face, and hopes to see YOU there.